The Name Says It All....The Maestro. Look No Further! Designed without compromise and built to an ever-higher standard, the Maestro was created with the desire to build the best pedicure spa available. Make a statement with this one-of-a-kind masterpiece. The Maestro's crisp lines and sculpted curves are unmistakable. Built entirely in the U.S.A. by Continuum. “Wow!” One word says it all. The Maestro is quite literally a work of art. Upon its debut, the Maestro's distinctive design and bold lines captured the industry's attention and continue to set the standard for high-end, luxury pedicure chairs. Its elegance is unsurpassed. An American made, welded steel frame provides each Maestro arch with maximum strength to support the entire pedicure spa. Continuum is the only pedicure spa manufacturer to use a steel frame design for extra support (up to 350 lbs.) on the entire base, chair and basin of the spa. Quality and attention to detail on every Continuum pedicure chair separate us from the competition and gives you total peace of mind. Client and technician can control the four-way seat movement with one touch of a button. As the client relaxes, the technician can adjust the seat to position the feet perfectly for the next part of the pedicure. At first glance, all you may notice is the striking look of the Maestro's signature seat, but there's so much more. After making your fabric selection, each Maestro seat is handmade by upholstery artisans in Milwaukee, Wisconsin, utilizing the finest, glove-soft Ultra-Leather and decorative stitching. Their expertise and precision ensures a consistent level of excellence. You will feel not only the quality of the material, but the passion that goes into every stitch. Beautiful finishes are an integral part on every Maestro pedicure spa. Whether genuine wood veneers or Formica, the globally recognized leader in the laminate industry, the Maestro finishes create a totally unique look. The finishes wear, impact, water and chemical resistant finishes provide the Continuum arch with unmatched quality and durability. Custom finishes available upon request. A defining feature of the Maestro, it is simply the toughest, most durable basin available. Created from a solid surface material similar to Corian®, the Maestro basin is chemical and crack resistant. Contoured footrests and removable foot massage rollers ensure a premium pedicure experience. With minimal care, the 5.5 gallon basin will maintain its splendor year after year. The solid surface basin is backed by a five (5) year warranty. Maestro's dual and independent leg supports, found on either side of the basin, pivot upward to support the entire leg, not just the foot. Comfort for both client and technician are finally achieved. 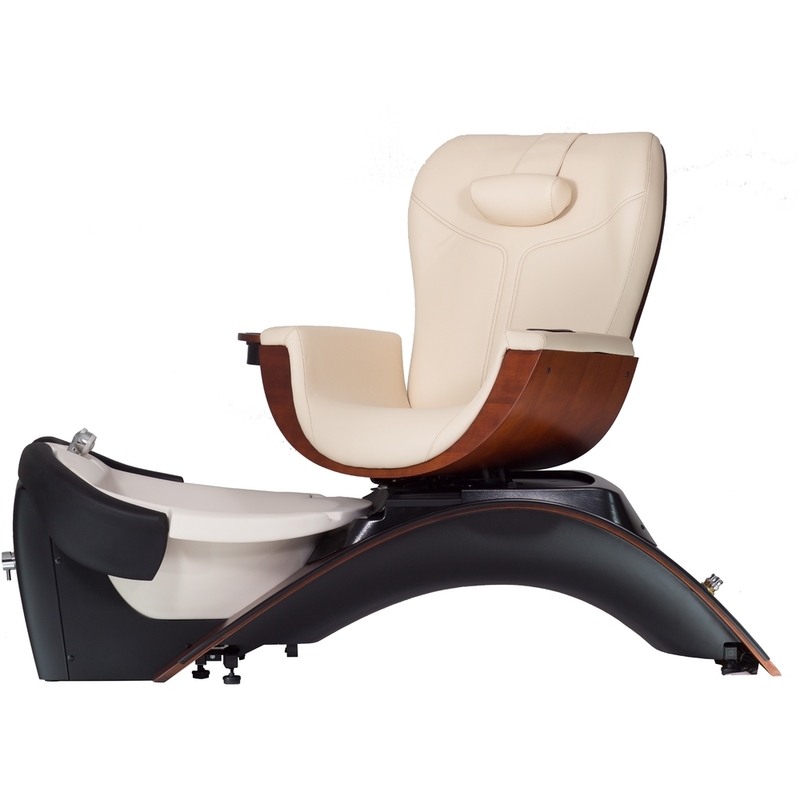 The Maestro pedicure chair features an ergonomically designed Vibra-Massage + Heat total relaxation system. Clients are relaxed by six (6) whisper quiet, oscillating motors embedded into the incredibly comfortable hand stitched cushion. Vibra-Massage and Heat are controlled independently by simply adjusting the intensity and location on the client's remote. Vibration is embedded into the seat back and bottom, while heat is focused on the chair's lower back offering another degree of total relaxation. Clients enjoy an invigorating foot massage from a powerful dual stream pipe-less magnetic jet. Continuum's pipe-less system ensures a safe and sanitary pedicure by eliminating internal pipes that recirculate water. The whisper quiet jet is compatible with tub liners, making it the convenient solution to pedicure spa sanitation. The magnetic jet is exceptionally easy to remove. Simply remove the wet-end of the jet after each pedicure to clean and sanitize.